Yesterday I received notice from Nik Software, who was recently acquired Google, that they were now bundling all of their professional photography plug-ins and dropping the price to $150. Shocked doesn’t even begin to explain the emotion that I felt. Nik Software was the first set of photo plug-ins that I had the pleasure of using and have since been my favorite. I would venture to guess that I put about 90% of my photos through at least one of Nik’s software programs. I can’t compliment Nik enough for this change in their business’s pricing structure. This allows so many more people to enjoy and benefit from great software at a very affordable price. Nothing makes me happier than seeing the creative work of others and this allows many more people that opportunity. Now, if your still on the fence about purchasing this even after the 70% price cut, you can pick up a 15 day fully functional trial to determine if this is something that will truly benefit your work-flow. The above image was processed using Nik’s Silver Efex Pro 2. I started with the Film Noir preset and adjusted settings until I was satisfied with the result. It is really hard to say which plug-in is my favorite because each image speaks to me differently. In previous posts you can see in the photo information sections what software I have used to process the image. If you’re interested in HDR I have a small write up under my review section that covers Nik’s HDR Efex Pro. Hopefully soon I will make the time to do full reviews of all of their software. Ultimately, I feel this is an absolute great deal. I hope at this price point they are still able to innovate and produce timely updates and improvements to their software. But the fact is that at this price every photographer should add this collection to their toolbox for post processing. And if this incredibly low price isn’t enough, you can still use the coupon code “bcox” to take another 15% off. When I first fell in love with photography I shot just about everything I could think of, except people. I’m sure mostly because it’s a bit intimidating. I know if someone who I don’t know raises a camera at me I’m immediately wondering why and what in the world are they going to do with that. But over the years, the more I shoot the more I have enjoyed capturing portraits of people. And of those I prefer people who are doing something or are telling a story with their actions. I am sure this is why I always enjoyed photographing musicians and performers. There is always a story to be told with the image. The image below was taken at Sherwood Forest Faire and I’m not even sure if the gentleman knew that I had taken his picture. I find this type of candid portraiture to be both fulfilling and mysterious. The fulfilling portion comes from being able to capture a moment in it’s truest sense. There is no posing, no setup, nothing forced. You just see the image in your mind and you capture the natural essence of the person without hindering the scene. The mysterious part is that you don’t have any knowledge of what the story truly is. The emotion was caught and there was no conversation or interaction involved, thus leaving you only guessing what the thoughts where behind the eyes. I much prefer the alternate method of interacting with people prior to, during, or immediately after capturing their portrait. I like to spend those few moments sharing a bit of myself and getting to know just a fraction of them. I probably should have with this guy, but he just seemed so into his own thoughts I just couldn’t bring myself to interrupt. What sounds more fun than spending a day with cosplayers? Exactly, not much. And with a Con like All-Con there was no shortage in variety. From the moment we arrived we were surrounded by Dr. Who, Storm Troopers, Derby Girls, zombies and no shortage of Steampunk. We had a great time, but I never thought walking the halls of a conference could be so exhausting. We ran into some old friends who we hadn’t seen in a long time and a few that we had. We attended a couple of the panels and the costume contest was amazing. Some of these costumes makers went all out. Next year we will definitely get the weekend pass instead of only attending one day. Overall I only had two complaints that I can think of. First off, this needs to be held in a much larger venue. Utilizing a hotel where vendors have to set up in hallways is just a bad plan. Now if this was a jewelry convention, or an art show it might have worked. But in an environment where you can expect larger than life costumes, maneuverability becomes quickly compromised. I saw more than a couple of people in wheelchairs who appeared to have a difficult time maneuvering in the tight quarters and those of us with strollers had to be patient occasionally and wait for the crowd to thin before heading to our next destination. If asked I would highly suggest utilizing a convention center in the future. My second complaint is for the most part just personal. It was hard to find clean backgrounds when taking pictures. If it wasn’t overly busy at the moment it wasn’t too much trouble to walk 20 or 30 feet to find some empty wall, but the littered hallways covered in fliers did at times make it a bit difficult. Three major themes seemed to dominate the con with Star Wars being most prominent. Everywhere you looked Storm Troopers were patrolling the halls, Sith lurking around the corners, there was no escaping the Dark Side. 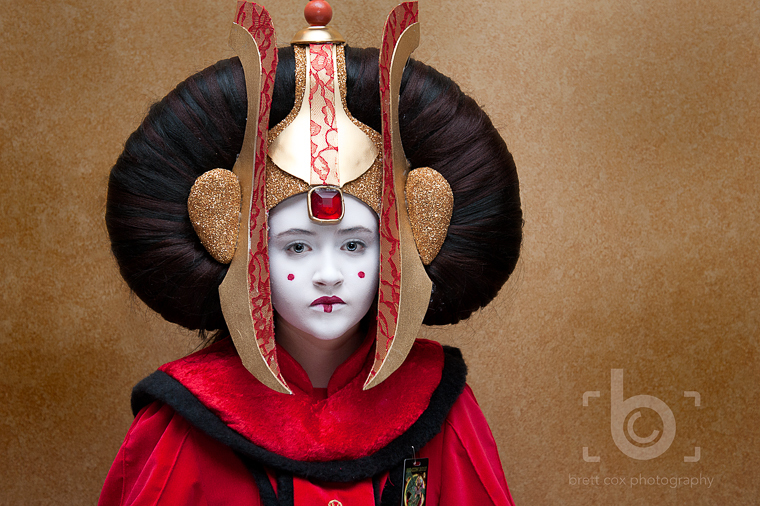 One of the most amazing costumes I saw was Queen Amidala. The second and third most popular costumes were Dr. Who and Steampunk. I think at one time I saw 8 different doctors togethers all working to save us from the Silence and Weeping Angels. Steampunk was very popular both by the players and vendors. I think this will soon be a theme for an upcoming photo shoot. We are looking forward to Comic Con later this year. Can’t wait to see what costumes people wear. Well, we finally made it to the Sherwood Forest Faire. One wouldn’t think it would be that great of a feat being that it’s only about a three hour drive for me. But alas, my children often dictate my schedule more often than I would like. I have been wanting/trying to get down to this renaissance festival for the last three years and i’m so glad we were finally able to make it. I’m sure by now you have figured out that my love for renaissance festivals is almost as strong as my love for New Orleans and I assume that comes from the never ending supply of interesting people. This faire was no exception. It very much reminded me of Scarborough Faire twenty years ago. Amongst the normal Renaissance Lords and ladies, shopkeepers and craft makers, Sherwood Forest is home to all things fairy tale and is inhabited by many such creatures. On the day we visited we encountered many fae who made the whole experience so much fun for my son. The two pictured below, Luna Nightwing and Akward MyStump presented glowing and sparkling treasures for Brady to take home and treasure forever. Or until he loses them. This little teaser of twelfth century life has left looking forward to another season of Scarborough Faire. After my grandfathers memorial my wife and I decided to head to New Orleans and share some culture with our children. Maybe too much culture for the thirteen year old in the course of a day. But none the less, one can’t become worldly if they don’t get out in the world. My grandfather often talked of his adventures in New Orleans and as you probably know by now it is one of my favorite places to visit. He and I only made one trip there together, but he spoke of the places he would hang out at. We ended up taking the kids to Preservation Hall, Cafe Du Monde and Jackson Square and let them enjoy themselves while listening to street musicians, eating some great food and watching some of the local performing artists. We managed to stay mostly dry as scattered thunderstorms continually passed over providing us the benefit of lowered temperature and lower humidity. The cloud coverage and wet ground also provided some nice light for photographing the city as well as reflections. This door and fire hydrant were just begging me to a photo while we sat and waited for the naked bike parade. Remember my comment about too worldly? Yea, there aren’t too many places I know of that can get away with having a naked bike parade in the middle of the city during the middle of the day. But that is just one of those things that makes New Orleans such a fun little city. While camping with the kids this last weekend I took advantage of being at one of the closest rock climbing areas to the Dallas / Fort Worth area and made sure to bring my camera. Being a rather mild winter where we are already seeing temperatures in the mid 60s and low 70s, I was surprised the crag wasn’t just packed with people. Probably a good thing it wasn’t as Brady was trying to be a bit more helpful than he needed to be. My favorite image from the first set was of this guy belaying his partner. I just loved his whole look in this environment. As soon as he glanced over at me I grabbed this image. And capturing him at an angle that you can see the climber in the reflection of his glasses was just icing. I can’t wait to go back to the park, maybe in the spring and try and get some shots from above. My gear is hidden away somewhere. It would be nice to take it out, dust it off and put it to use again. For weeks now my oldest daughter has been bugging me to go camping. And every morning on our way to school I would say to her, “Don’t you think it’s a bit cold to sleep in this weather?”. She claimed it wasn’t so and we set a tentative date, pending weather, to do a quick over night trip. Now I have to be honest, the thought of getting back in a bag for a night was quite exciting for me as well. As you may know, I was raised in the PNW and many of my fondest memories include camping, backpacking or some other form of outdoor activity. And I had been recently complaining that many of the outdoor activities I enjoyed doing had become a thing of the past since Brady was born. Secondly this trip was going to allow me to try my hand at some star photography. Recently, someone posted a link on Google Plus for Dave Morrow who not only has a fabulous collection of work but also shares his methods for capturing and post processing star photography. I picked up his training collection and I was eager to come up with a location far enough away from the city lights to try and capture more than the 5 stars I see from my backyard. I finally came to the decision to take the kids to Lake Mineral Wells State Park and by complete chance the weekend we chose to go happened to be one in which the moon rise wasn’t going to occur until after midnight. This provided me with about a 3 hour window for shooting. However due to weather.com’s mis-forcast of the overnight low I was rustling children into sleeping bags long before that window expired. But my kids did manage to allow me to grab a handful of shots before the evening chill was too much for them. None of which I loved, but they did provide me something to work with. This shot was taken maybe 15 feet from our campsite. I was amazed at just how much information my camera picked up. The warm glow on the trees to the left was the illumination from our fire. The white illumination on the branch in the center is from a Coleman LED lantern that was in our tent. The streak in the sky was a passing satellite.